Amidst the rows and floors of hotel rooms in Hotel Commonwealth, one suite stands out. Guests who book the “Terrier Suite” enter into a room decorated with pictures of alumni and BU’s mascot, the Boston terrier. Hotel Commonwealth, located at the eastern edge of Kenmore Square along Commonwealth Avenue, used to be owned by Boston University. The university sold Hotel Commonwealth in 2012 to the Denver-based real estate company Sage Hospitality and investment firm Fundamental Advisors LP for $79 million, according to BU Today. The hotel has 245 guest rooms and suites, according to its website, and is the official hotel of the Boston Red Sox. 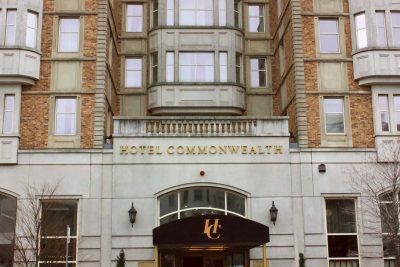 BU spokesperson Colin Riley said the university invested in Hotel Commonwealth to help improve Kenmore Square and create a place for people to stay in the area. The university still owns the property on which the hotel sits, Riley added. 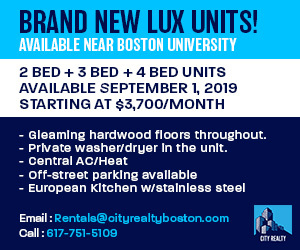 Adam Sperling, Hotel Commonwealth’s general manager, said the “Terrier Suite” was inspired by the property’s proximity to the BU campus — though it was not created because of the university’s ownership. “BU did own the hotel at the time we created the Terrier Suite, but it really is more of a reflection that BU is obviously right out of our door, we’re almost on BU’s campus as you know,” Sperling said. Sperling said the “Terrier Suite” is a unique place to stay for people who visit BU’s campus. Redevelopment is underway for nine buildings on the north side of Kenmore Square across from Hotel Commonwealth as part of a 2016 sale BU made to developer Related Beal for 310,000 square feet of commercial space. In addition, a 300-foot hotel tower and surrounding plaza has been proposed for the western corner of the square. Riley said new developments in Kenmore Square will be beneficial for Hotel Commonwealth, as well as for BU, as they will attract people to live in, work in and visit the area. “I think they’ll only benefit because ultimately you’ll have a very busy office and retail environment, with retail and commercial development on the north side,” he said. Hotel Commonwealth and BU partner to offer special rates to some university guests, Sperling said. Commencement in May is one of the most popular times for university guests to book stays at Hotel Commonwealth, Riley said, noting that bookings around this time can get very competitive. Lauren Cooper, a sophomore in the Sargent College of Health and Rehabilitation Sciences, said her family will stay in a hotel outside Boston when they visit because prices in the city are high. Keith Lovett, a senior in CAS, said he thinks that as BU is a large school, it is important there are hotels near campus to house guests for important events during the school year. “I think whereas BU is such a large school, it’s good for families to be able to visit, especially in key times, like during the graduation ceremonies,” Lovett said. Stephanie Molano, a junior in the College of Communication, said her family has stayed in an Airbnb instead of a hotel in the past because it was more convenient for them. Mia Cathell contributed to the reporting of this article. > But if you’re coming to visit the university, then you would pay whatever the prevailing rate is. FYI according to http://www.bu.edu/alumni/benefits-resources/travel/ BU alumni discounts are available at Hotel Commonwealth.